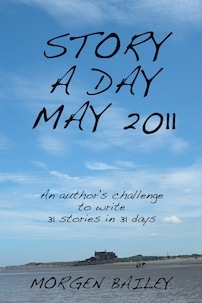 Story A Day May 2011 comprises the 31 short stories and flash fiction written from daily prompts given during May 2011. No prompt information, no author comments, just the stories themselves. Inspired by the Story A Day.org website. Characters include the heart-tugging ‘Threadbare Girl’ (who we meet early on then conclude with), a blue-blooded couple with a rocking horse, husbands and wives seeking revenge, an alien on a blind date, a grandfather afraid of heights, two historical figures, a young girl with a very vivid imagination, a mother’s desperate hospital visit and others portraying random acts of kindness. We have the Bermuda Triangle, the Wild West and more than one shaggy dog story. From Chelsea buns to casseroles we share highs and lows but they all go to show what can be done with a prompt, a few hours and a colourful imagination. http://gardenurthark.wordpress.com/2012/03/23/morgen-baileys-story-a-day-may-a-review but be warned there are quite a few spoilers.